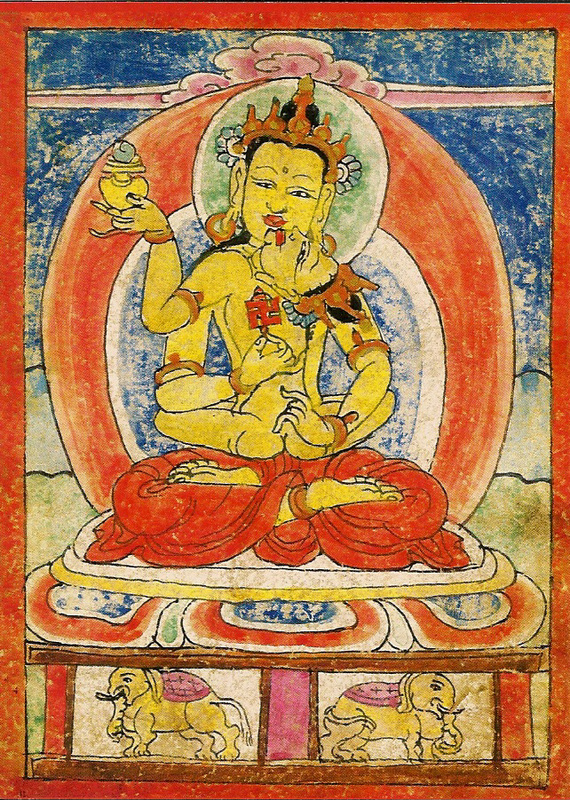 In Tibetan astrology, there is a twelve-year cycle. Each of these years is characterized by a different animal and associated with one of the five elements. Therefore, a full cycle of the twelve animals being associated with each of the five elements is sixty years. 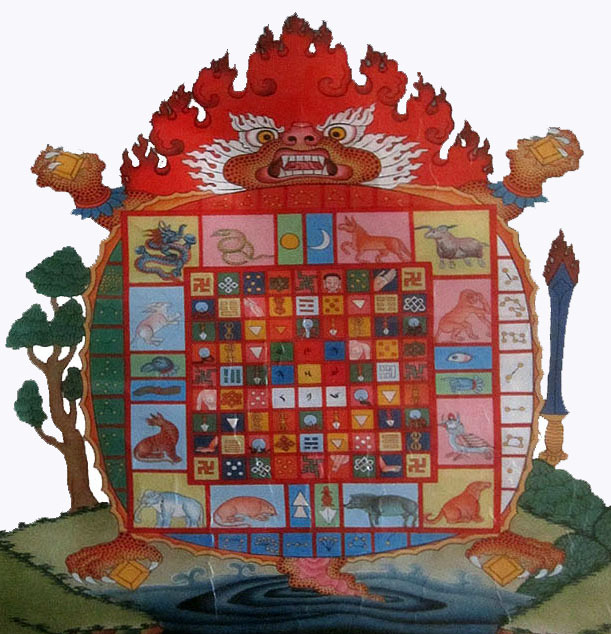 The twelve animals according to the Yungdrung Bön texts are the Rat, Elephant, Tiger, Rabbit, Dragon, Horse, Snake, Sheep, Garuda, Monkey, Dog and Pig. Each animal is associated with a specific element for its life-force as well as a specific direction which is determined by the life-force element. Not only are these twelve animals associated with a particular year, they are also associated with particular months, days and hours. 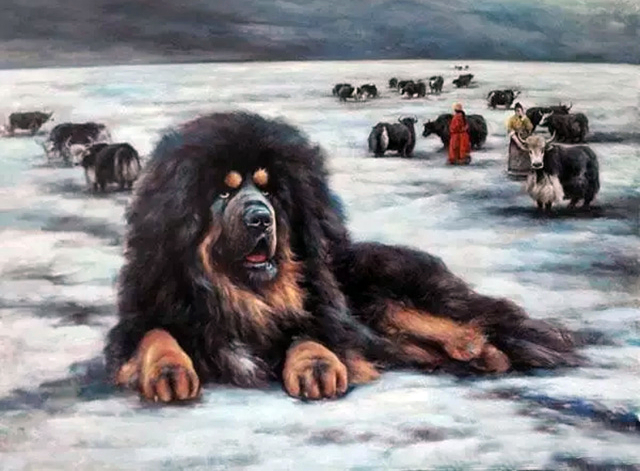 Feb 16, 2018 begins the Tibetan New Year, or Losar, and the year of the Earth Dog. People born during a Dog year will have an emphasis of the specific qualities associated with the symbol of the Dog. 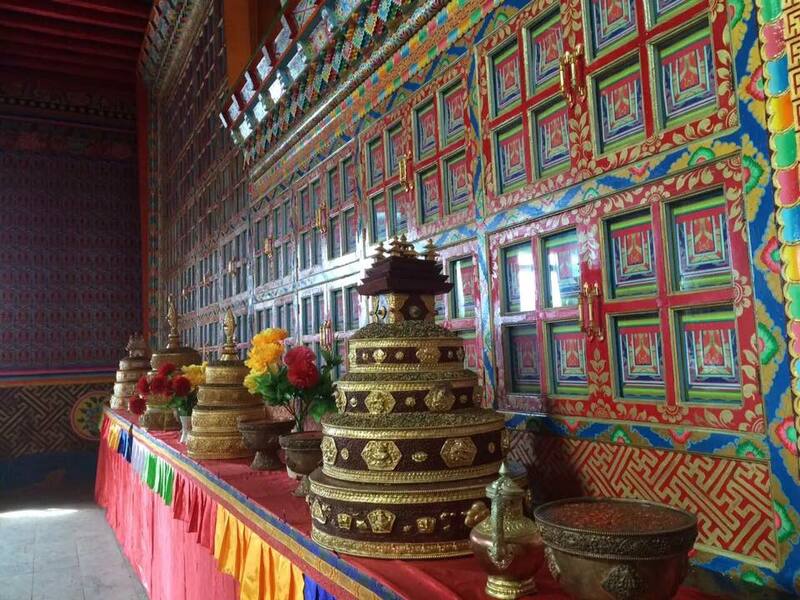 (These years correspond with the Tibetan lunar calendar and begin sometime between late January and early April.) In astrology, the element which governs the life-force of the Dog is Earth and its positive direction is Northwest. So, if a Dog person wanted to strengthen their life-force, they would focus upon strengthening the element of Earth internally and externally. Because the positive direction is Northwest, facing this direction while meditating, engaging in healing practices or just relaxing and taking deep breaths is beneficial. In general as an astrological symbol, the Dog person is loyal, straightforward, and honest. Because of their desire to offer their help and support, they are diligent and responsible with tasks. The Dog person takes great care in all that they do and is methodical and precise. Because of this, they do not like to be rushed in completing tasks or making decisions. Others can become frustrated at the Dog person’s seeming inertia when actually they are diligently analyzing the situation in order to be certain in making the correct decision. This tendency towards analysis and judgement can be in excess and lead the Dog person to overly analyze situations and consequently fall into despair or pessimism. For this reason, the Dog person can be seen as quite serious. However, they do not take their loved ones for granted and their relationships are long-lasting. The Dog’s soul day is Monday and its life-force day is Wednesday. These are the best days for beginning new projects and activities that are meant to increase or develop something. The obstacle day is Thursday. This day is best for purification and letting things go. It is not a favorable day for beginning new activities. 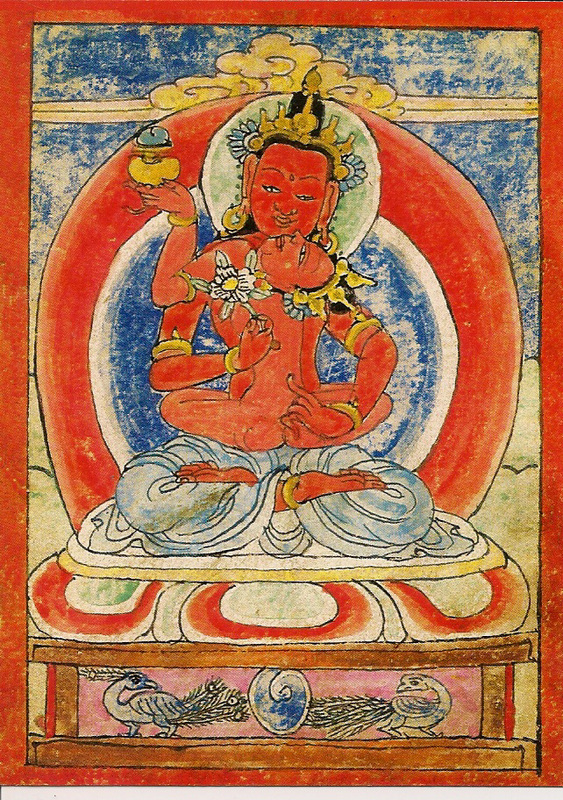 In Tibetan astrology, there is a twelve year cycle. Each of these years is characterized by a different animal and associated with one of the five elements. Therefore, a full cycle of the twelve animals being associated with each of the five elements is sixty years. 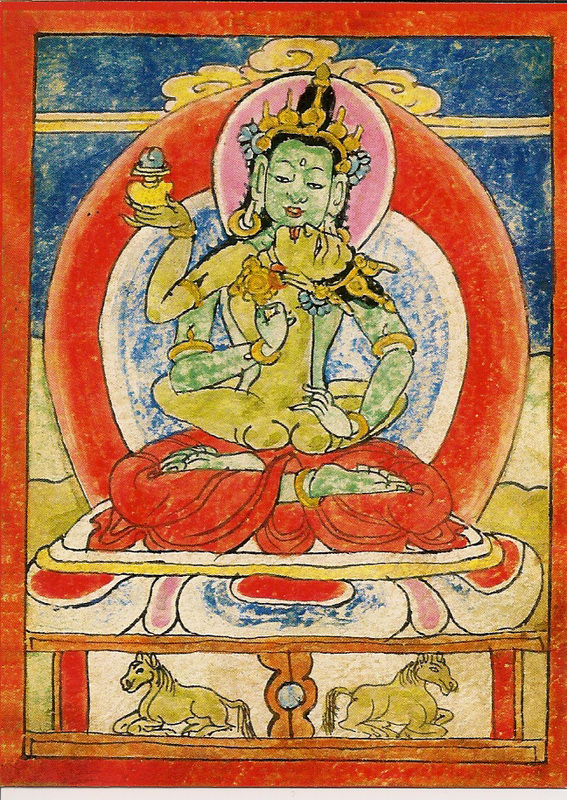 The twelve animals according to the Yungdrung Bön texts are the Rat, Elephant, Tiger, Rabbit, Dragon, Horse, Snake, Sheep, Garuda, Monkey, Dog and Pig. Each animal is associated with a specific element for its life-force as well as a specific direction which is determined by the life-force element. Not only are these twelve animals associated with a particular year, they are also associated with particular months, days and hours. Feb 27, 2017 begins the Tibetan New Year and the year of the Fire Garuda. 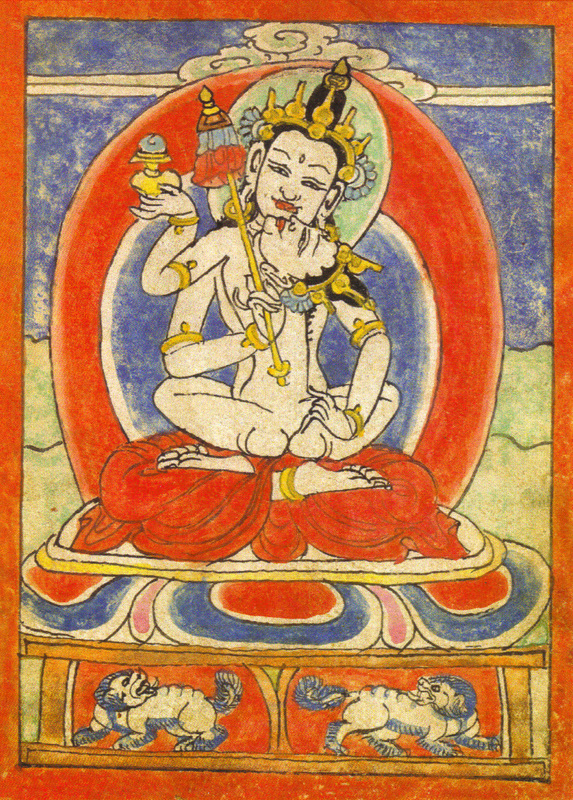 (For the Yungdrung Bön, it is the year of the Garuda. Others use the symbol of the rooster.) The Garuda is a bird both historical and mythical in scope similar to the Thunderbird. 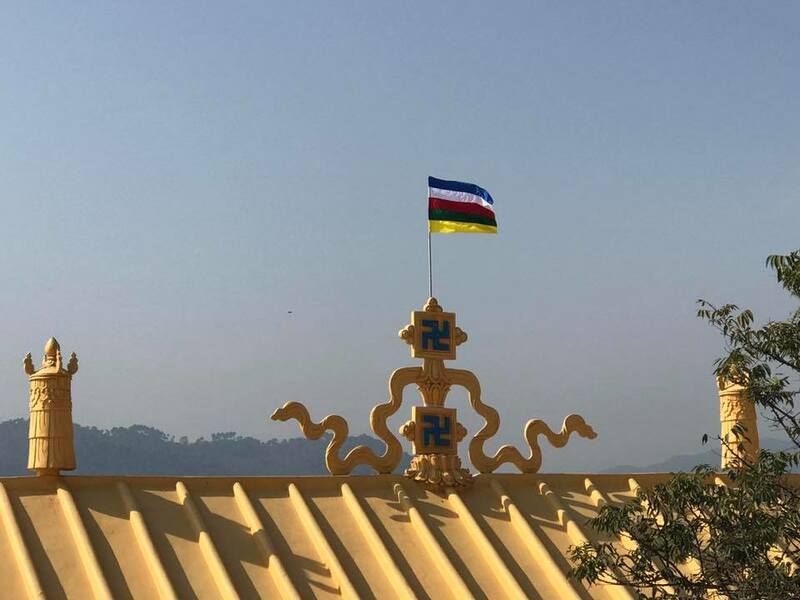 It is intricately associated with Lord Tönpa Shenrap Miwoché and the ancient kingdom of Zhang Zhung and Mount Tisé a.k.a. Mount Kailash. People born during a Garuda year will have an emphasis of the specific qualities associated with Garuda. 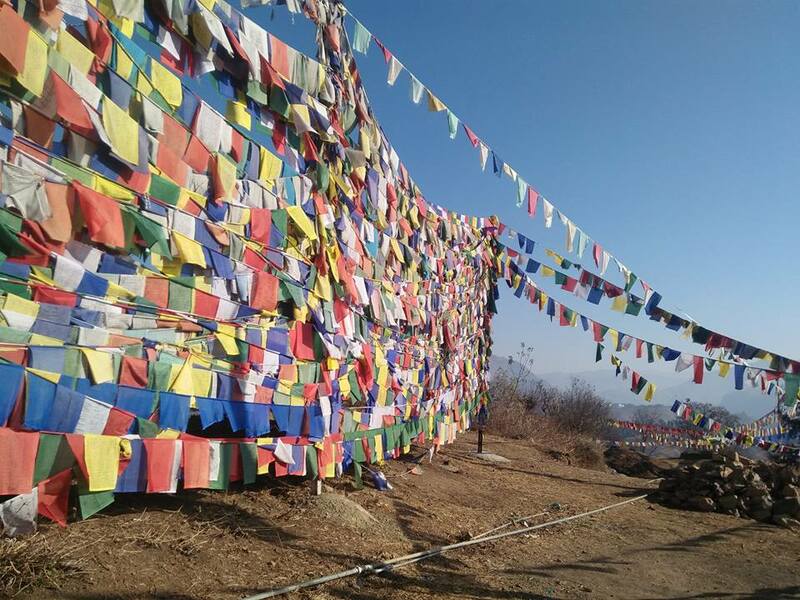 (These years correspond with the Tibetan lunar calendar and begin sometime between late January and early April.) 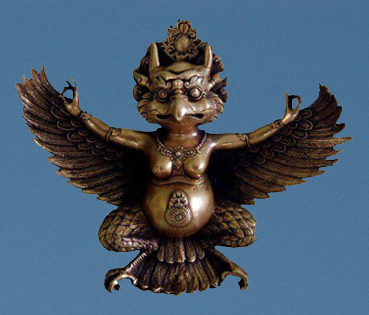 In astrology, the element which governs the life-force of the Garuda is Metal (space) and its direction is West. So, if a Garuda person wanted to strengthen their life-force, they would focus upon strengthening the element of Metal internally and externally. Because the positive direction is West, facing this direction while meditating, engaging in healing practices or just relaxing and taking deep breaths is beneficial. In general as an astrological symbol, the Garuda person has a zest for life and is uncomfortable with the limitations of tradition and convention. The Garuda has confidence in itself and is ambitious with goals that can often seem unrealistic to others. However, it is a perfectionist and a master of organization that is able to find a way to accomplish difficult tasks. The Garuda‘s joy and charisma attracts many friends who benefit from its spontaneous generosity. Its flair for life and confidence in itself also attracts the attention of powerful people who help the completion of its goals. In some, this unshakable confidence might lend itself to conceit and self-centeredness. The Garuda finds the most joy when it remains balanced rather than caught in a cycle of highs and lows. The Garuda‘s soul day is Friday and its life-force day is Thursday. These are the best days for beginning new projects and activities that are meant to increase or develop something. The obstacle day is Tuesday. This day is best for purification and letting things go. It is not a favorable day for beginning new activities. People born during the year of the Snake will have an emphasis of the specific qualities associated with Snake. 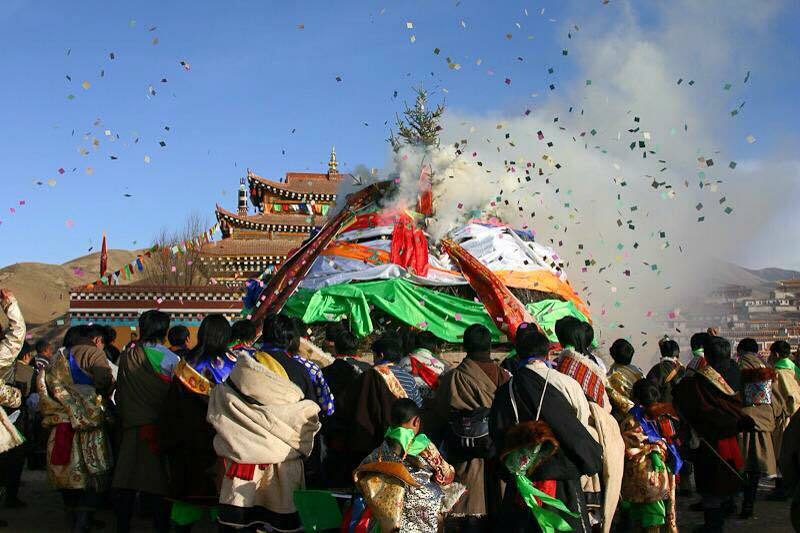 (These years correspond with the Tibetan lunar calendar and begin sometime between late January and early April.) The element which governs the life-force of the Snake is Fire and its direction is South. So, if a Snake person wanted to strengthen their life-force, they would focus upon strengthening the element of Fire internally and externally. The positive direction is South. Therefore, facing this direction while meditating, doing healing rituals or just relaxing and taking deep breaths is beneficial. In general, the Snake is can see the depth of things and spends a lot of time thinking and processing. The Snake can recognize the underlying motivation of others even if they do not recognize it within themselves. The Snake can use this to their advantage and can be underhanded at times. The Snake enjoys the good things of life and loves to be in elegant and beautiful surroundings. The Snake can have an intolerance for hardship or discomfort. The Snake can be magnetic and charming but can also be vengeful when angered. The Snake has a good sense of humor, is socially graceful and often surrounded by admirers. 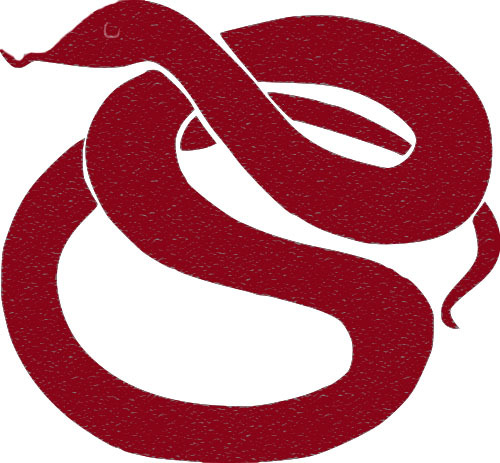 The Snake could benefit from the practice of tolerance and openness. The Snake‘s soul day is Tuesday and its life-force day is Friday. These are the best days for beginning new projects and activities that are meant to increase or develop something. The obstacle day is Wednesday. This day is best for purification and letting things go. It is not a favorable day for beginning new activities. 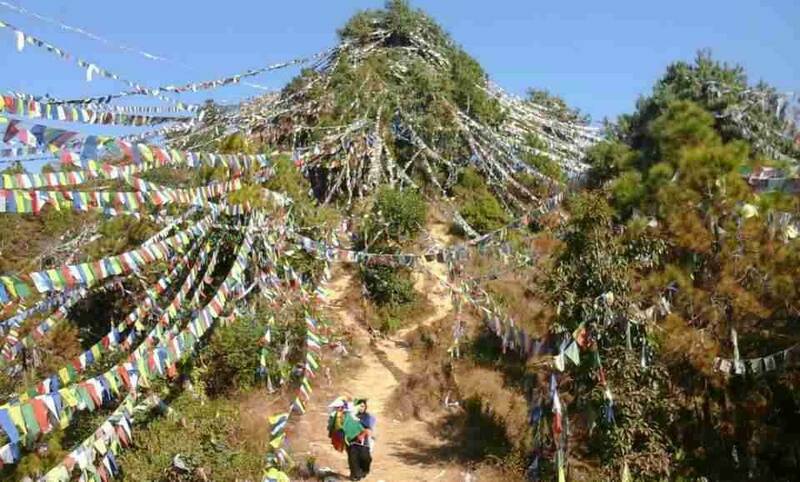 This Yungdrung Bön prayer flag has a center image of Tapihritsa. 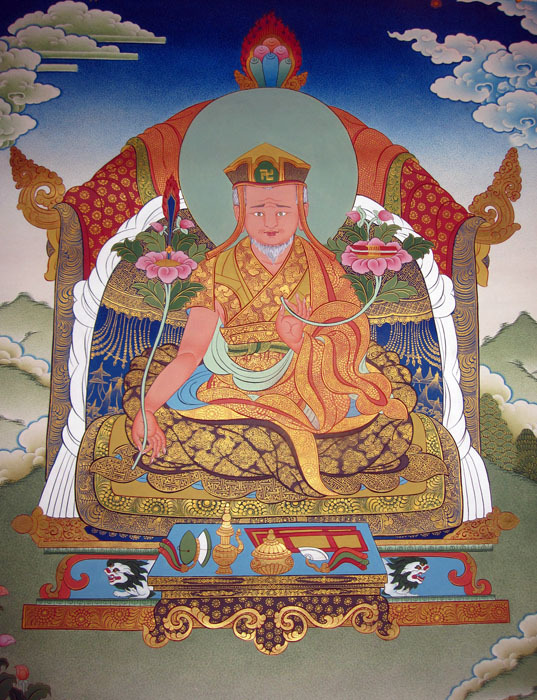 He was an historical person of the 8th century who attained full realization and is seen as being merged with the primordially enlightened Küntu Zangpo. 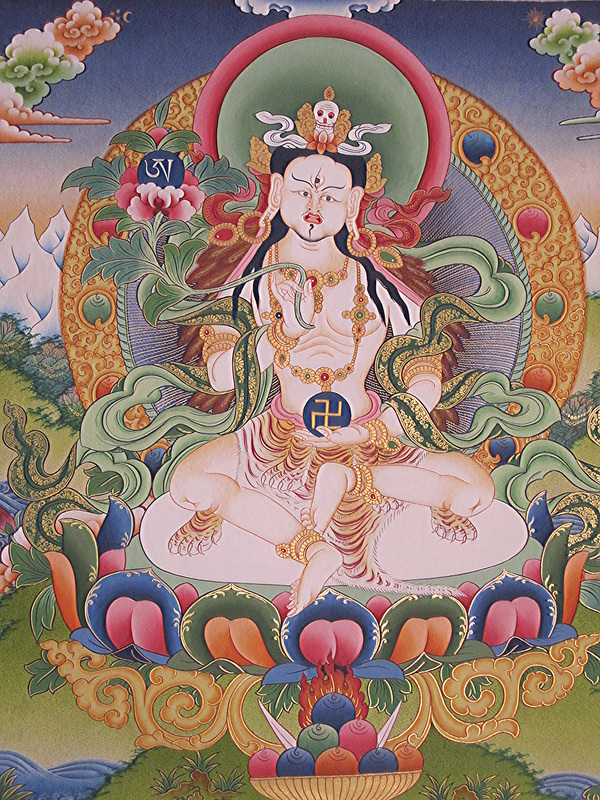 Tapihritsa is an important figure in the lineage of the Zhang Zhung Aural Tradition of Dzogchen. The direct lineage of this tradition was never interrupted in any way and continues to this very day. 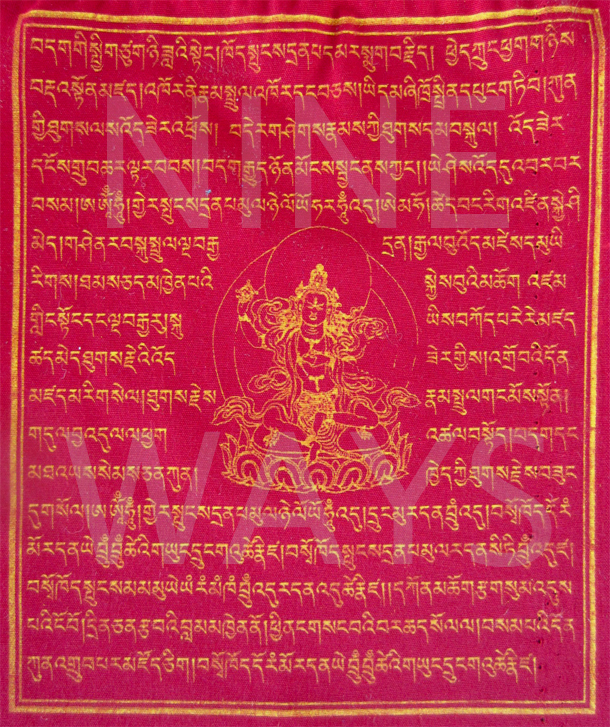 This prayer flag contains the “Invocation of Tapihritsa” as well as the Bön ‘SA LÉ Ö” heart mantra which is said to contain the complete introduction to the natural state of the mind. 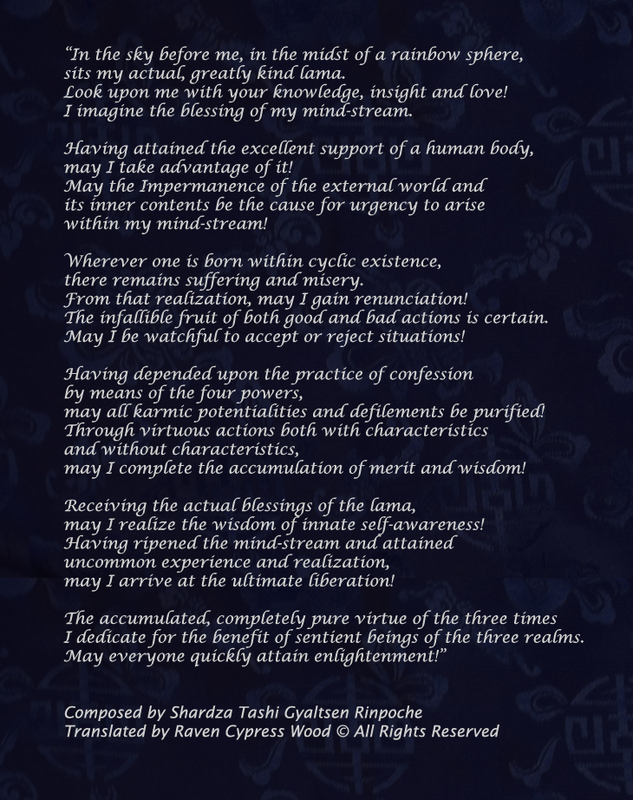 -From The Invocation of Tapihritsa. Translated by Raven Cypress Wood. 2016 will be the year of the Monkey. Therefore, people born during this year will be a Monkey and will have an emphasis of the specific qualities associated with Monkey. 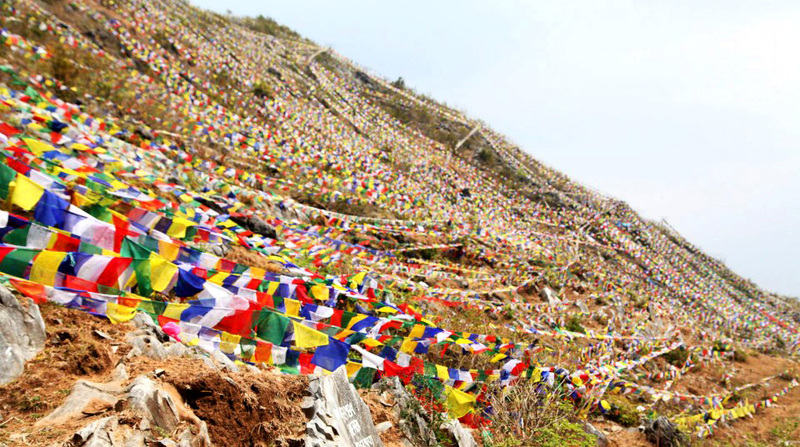 (This year corresponds with the Tibetan lunar calendar and begins February 08, 2016.) The element which governs the life-force of the Monkey is Metal (space) and its direction is West. So, if a Monkey person wanted to strengthen their life-force, they would focus upon strengthening the element of Metal internally and externally. The positive direction West. Therefore, facing this direction while meditating, doing healing rituals or just relaxing and taking deep breaths is beneficial. In general, the Monkey is friendly, adaptable, playful and thinks outside of the box. The Monkey does not like to be trapped in any way and can use its ingenuity and keen sense of strategy to keep itself free. Although the Monkey has a good sense of humor and a sharp mind, too often it is tempted to use these qualities to elevate itself while lowering others. The Monkey is skilled at finding ways to benefit from an opportunity. Even when faced with difficulty, the Monkey most often lands on its feet. The Monkey has an insatiable desire for knowledge and study, but can grow bored once it has reached a level of mastery. 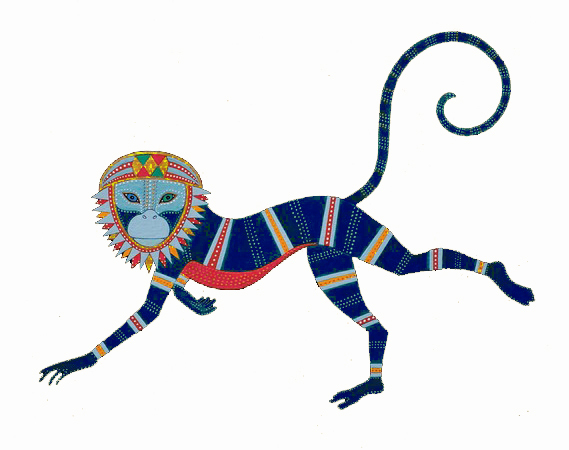 The Monkey‘s soul day is Friday and its life-force day is Thursday. These are the best days for beginning new projects and activities that are meant to increase or develop something. The obstacle day is Tuesday. This day is best for cleansing and letting things go. It is not a favorable day for beginning new things. According to Tibetan astrology, we each have Five Natal Forces within us that are characterized by one of the five elements of earth, water, fire, wood or metal. (Metal is the astrological equivalent of space and wood is equivalent to wind.) These Five Natal Forces are the Vital Life-force, the force of the Body, Personal Power, Lungta and Soul. The Vital Life-force is the force within an individual that is responsible for maintaining the connection between body and mind. As long as this connection exists, there is vital life-force. This force can be stable or unstable. The force of the Body is the force of our bodily health. The force of Personal Power, or wangtang, is the natal force of personal power or charisma, and is associated with prosperity. When this force is strong, it can lead to accomplishment of one’s goals with few or no obstacles, protection of the vital life-force, and general protection from any kind of danger or loss. Lungta is the force within an individual that is associated with good luck. Lungta literally means ‘wind-horse’. 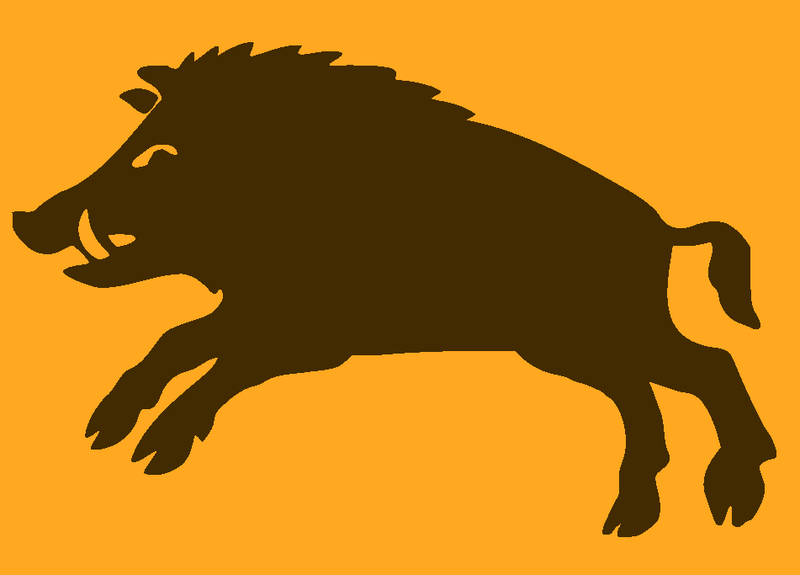 This symbolizes something that can move very fast and with great power. The Lungta has the ability to strengthen and uplift all of the other natal forces. The Soul is the mother of the vital life-force. When the Soul is strong, it gives the individual the ‘glow’ of health. This force can be variable depending upon whether it is strengthening or declining. According to texts, “Virtue is the mother of the soul.” Therefore, acts of virtue strengthen the force of the soul. This force cyclically moves through the entire body each month. See previous article, “Movement of the Soul Through the Body”. Because each of these natal forces are associated with a specific element, they not only characterize these forces in general but are also affected by the elemental qualities of each calendar year. In this way, it is possible to anticipate the potential for one or more of these forces to encounter circumstances of support or decline. This is due to the fact that the five elements interact with one another according to their unique qualities. For example, water is the enemy of fire, but wood is the mother of fire. There are four possible relationships between elements: mother, child, friend or enemy. A person born in 1973 would be a Water Ox and the force of their lungta would be ruled by the element of water. For 2015, the force of lungta is ruled by the element of fire. Fire is in the friend relationship to water. This is considered a very good position and, in general, this person could expect their force of lungta to be strong during 2015. Calculations such as this are possible for each of the Five Natal Forces. If someone wanted to strengthen one or more of the natal forces, the texts prescribe methods of doing so including numerous rituals and practices. In general, virtuous activity, sincere spiritual practice and a mind of loving kindness protect these forces and keep them strong and well-developed. 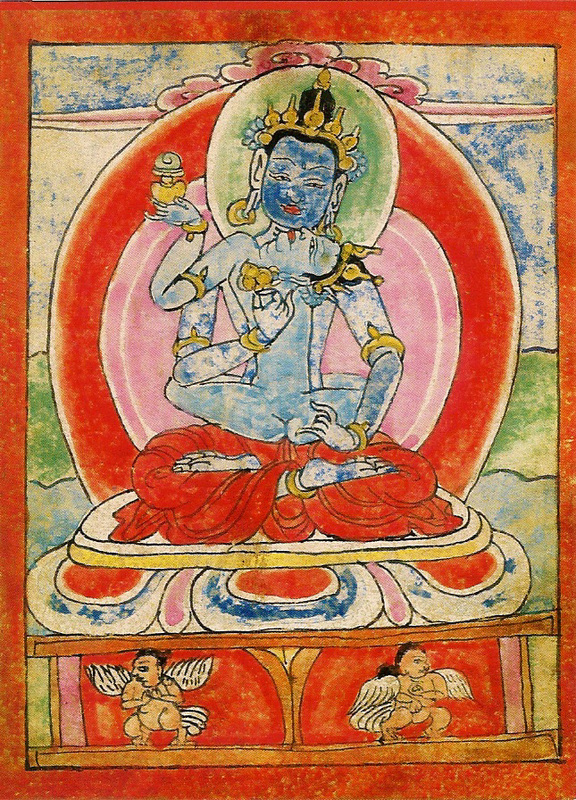 In the Yungdrung Bön tradition, the soul is known as la. According to sutra, the soul is defined as the innermost, subtle essence of the five elements of space, air, fire, water and earth. 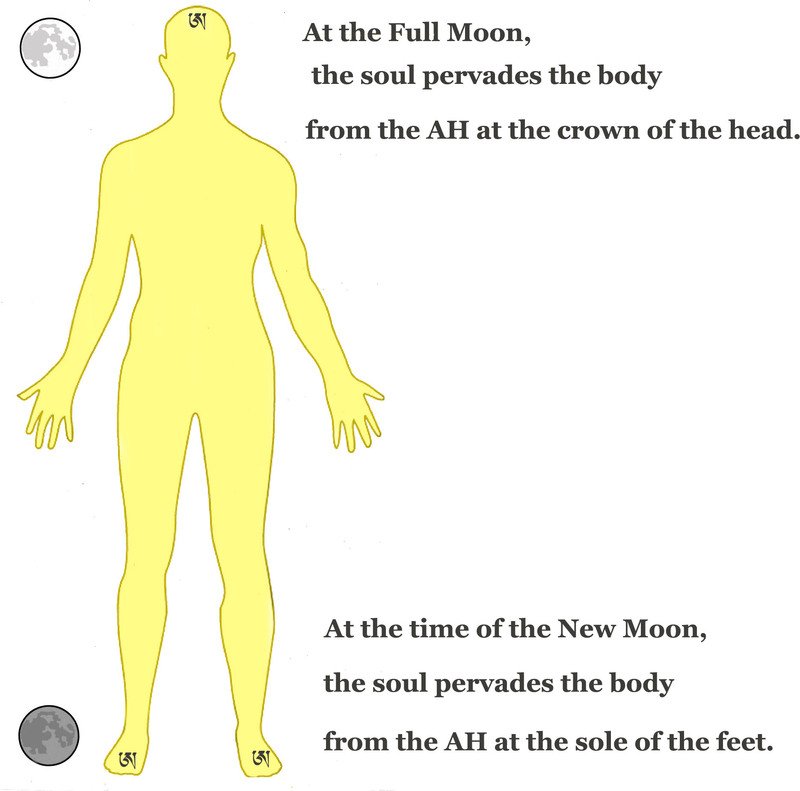 The primary locus of the soul continually moves throughout the body and completes one full cycle each month in accordance with the cycle of the moon. 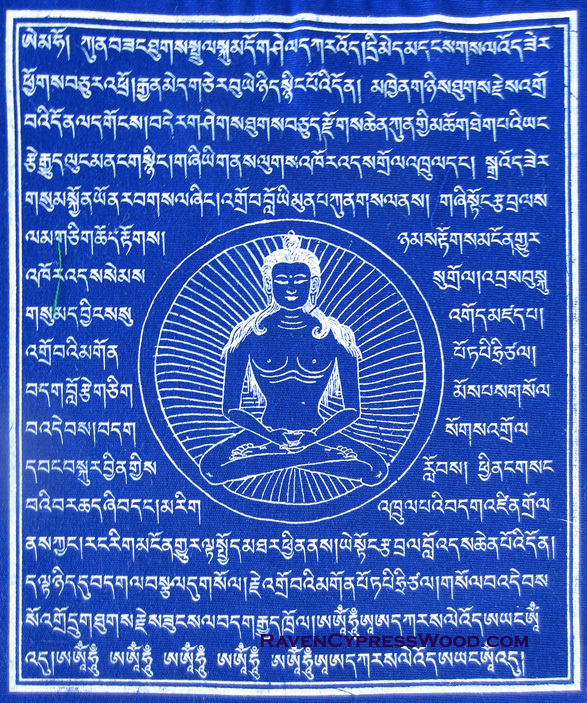 Within Tibetan medical texts, it is advised to not bleed, damage, or conduct surgery in the area of the body in which the soul is located at any given time. The exact location of the soul differs slightly between texts. 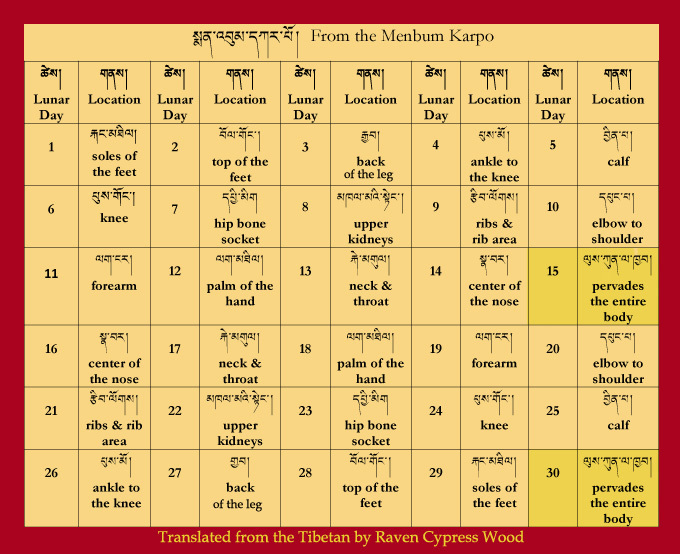 The translation below is from the medical text, Menbum Karpo.